Sr. Dorothea (Mary) Penta, S.N.D., 85, of Windsor, died peacefully Friday, (July 7, 2006) at St. Francis Hospital, Hartford. Born June 28, 1921, in Boston, MA, the daughter of John and Mary (Mercandante) Penta, she was the loved elder of siblings Dorothy, John, and Ann Marie. A graduate of Fitton High School and Emmanuel College, Boston, Sister earned an M. Ed. at Boston College and Certification in Administration at Fairfield University. 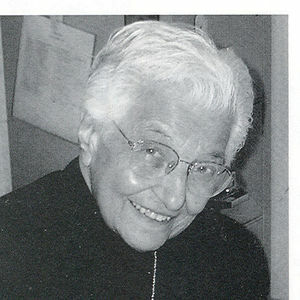 A woman of wit and wisdom, Sr. Dorothea stood tall in Notre Dame: in leadership, as councillor; in education, as junior/high school teacher, principal, supervisor, instructor to teenage mothers, secretarial assistant; in church ministry, as parish education director; and, in later years, as teacher to younger community members and vibrant source of information and conviviality to her Julie House retirement residents. Characterized by deep devotion and faith, love of family and Congregation, the Catechism of the Catholic Church defines her best: straightforward simplicity, filial trust, joyous assurance, humble boldness, and the certainty of being loved. (CCC 2778) She leaves her dear devoted Dottie, Ann Marie, John, their cherished children and grandchildren, countless friends, former students, and Sisters in Notre Dame, as well as a thought dear to her heart, We will all be together with Christ.